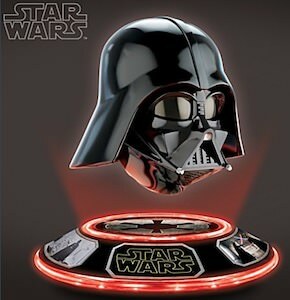 Now Star Wars fans can own this Levitating Darth Vader. As you can see there is black base with the Star Wars and Empire logo on it and some other picture too. Above the base you will find the famous black helmet of Darth Vader and it is just floating above the base which really makes it cool. If it gets dark then you can turn on the build in light so that it looks even more amazing as the light is red and comes from LED’s. A floating Darth Vader head is something a home of a true Star Wars fan needs.